THE WRITING BUDDHA - Opinions | Books | Movies: Marry Me, Stranger by Novoneel Chakraborty (Book Review- 4*/5) !!! 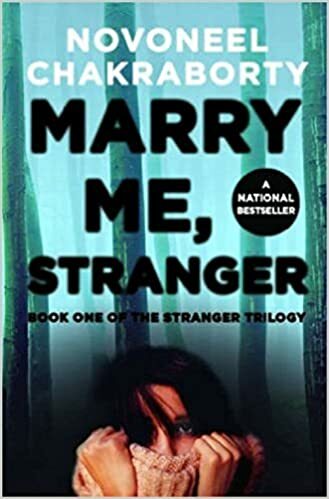 Marry Me, Stranger by Novoneel Chakraborty (Book Review- 4*/5) !!! Novoneel Chakraborty is a brilliant writer and I am glad that I have been able to read each of his books. He is one of the few Indian pulp-fiction writers who has great command on the language which makes his novel a great reading experience. You can easily complete any of his books in a single sitting itself. This time I picked his most-talked about book- The Book 1 in "The Stranger Trilogy" which is named "Marry Me, Stranger". Though I had this book with me for last 1.5 years but I didn't read it as I have the habit of reading trilogies only after it's last part is released. I am an impatient personality, after all. Haha! After completing this book, I can only say that Novoneel is one of the few authors like Ravi Subramanian who keeps improving with his every book. And this one is clearly another feather in his cap. The language and narration that Novoneel uses to tell his story is very simple yet so authentic and beautiful that you find it very literary. And even though his book deals with love story as a foundation of the premises, he doesn't restrict the story to the tale of two lovers only. He always add that punch in his books which makes them special and talking about this book specifically, author has just mind-blown with each page. The suspense that he keeps almost till the last page skews a reader in you as initially you die to know why a "stranger" is troubling the protagonist and later on, you almost kill yourself while reading as fast as you can to know who actually the stranger is. And the way anti-climax and climax is written, you almost get surprised with an unexpected twist looking into your face. And the book ends at a very great moment that will not let you sleep until and unless you do not start reading the second book in the trilogy. Philosophical lines in between are the icing on the cake. In his 5th book, Novoneel has given great description of each character which makes it easy for you to understand psyche of each one of them. It helped this thriller wonderfully as you know which characters are going to support the protagonist up to what level. And that makes it more interesting for a reader to keep guessing who the stranger is. Though at a point of time, you start feeling that it's kind of ghost who's behind the protagonist but still you want to know why exactly is it behind the protagonist. Right from the first page to the last, Novoneel keeps this book powerful enough to make the reader read it without a blink of an eye. For me, this is one of the best work of Novoneel till now. I am rating it 4 stars out of 5. All of his last 4 books have received 3.75* each from me. Finally, for me, Novoneel has taken his writing to the next level with this book. I am going to start reading The Book 2 in the Stranger trilogy from tomorrow.